This first book The Perennial Project will be followed by two sequels. 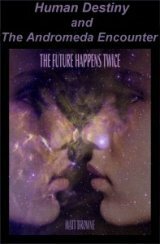 The second book entitled Human Destiny tells the story of Julara and her fellow crew returning to planet Earth. The launch from Acantarius takes place about 100 years after the first colonist had arrived. Because there is still no communication from Earth, the settlers are deeply worried about what may have happened to the human civilization after the volcanic eruption in the year 2089. The Colony Council decided to reuse starship Perennial for the return voyage. Because the embryo-splitting technique can always be repeated, another set of identical twins of the last crew, together with their androids, are chosen to man the ship. When they arrive on Earth 42,000 years later they find that there are still humans surviving. But all technology has been lost and the cultures are living on a Stone Age level: the Forest People and the Cave People. A long ice age which has lasted for thousands of years has prevented speedy human development. Now at a time of climate change, farming has just been reinvented, but tools are still made of stone. The Cave People have developed a new religion that prohibits them from entering the Old Cities where some skyscrapers can still be seen in southern areas that were out of reach of the powerful glaciers. The ground is covered with debris from the gigantic volcanic eruption. Julara and the others are confronted with the question of intervening in the people's nature-oriented lives. Should they introduce education and technology? The people they meet seem content. It takes a while to learn their language and communicate with them. At first it is decided to keep technology away from them and focus on studying the history on Earth. But then they detect another ship in orbit. This time it is an alien ship with an intelligent species from the Andro-meda galaxy. But something must have gone wrong. The passengers do not revive and remain in a mysterious cryonic suspension. The ship has traveled for million of years with speeds far superior to that of Perennial. Julara must decide whether or not to attempt thawing them. The Andromeda Encounter, which completes the trilogy, begins on Earth 700 years later. The travelers who had returned from Acantarius have failed to hide their technology. History now takes a different turn. New Cities are built and space technology soon flourishes again. There is still no communication with Acantarius. Telescopic observations make it clear that the climate on that planet has changed dramatically. The Earth Government decides to set up a new ambitious starship program. Many ships are manufactured to travel to different habitable planets inside the galaxy. But one ship is designed to take a much longer journey to the home of the extraterrestrial species that, although failing to revive, had arrived 700 years earlier. For the first time in history, human civilization makes an attempt to travel to another galaxy. Some of the alien visitors' technology can be reused, limiting the travel to eighty-nine million years to bridge the enormous distance between the two galaxies. Julara and her fellow crew grow up in the distant future where Perennial sets a course to the star system where the intelligent signal originates. However, it is found to come from a barren moon orbiting a planet with a runaway greenhouse effect. Julara discovers that this planet must have once been populated by the alien species, and she suspects that they have moved on to another region in the Andromeda galaxy. The crew decides to search for them. But they are doomed to live their lives on the starship without reaching the new location. Only their younger twins, born many centuries later, eventually encounter a magnificent planet inhabited with billions of individuals of a friendly but peculiar race. Join my Open Trilogy Project (OTRIP) and become a co-author of the sequels ! Click on the Contact button below and send me an email.